February is that month where I look our the window, and I say to myself “Really? Still? Christmas is long gone, we don’t need this freezing weather anymore.” As much as I try, February just doesn’t listen to me. So I have declared February- The Month Of Indulge. I mean come on, it has an entire day dedicated to chocolate! Or love, or whatever. (but clearly the chocolate). So the theme of this months recipes, indulge!!! What is your favourite indulgence? Let me know in the comments below, and I just may veganize your favourite! 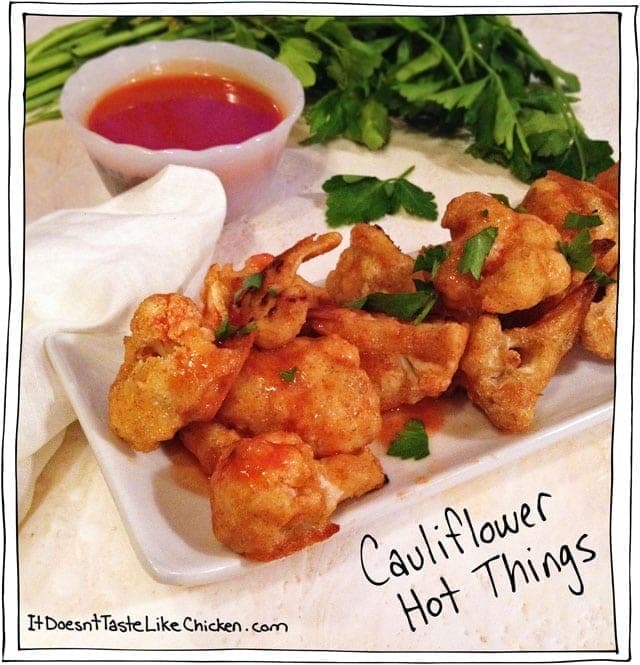 In the meantime, get started with some Cauliflower Hot Things! Oh my, oh my! Did you see that picture up there? Pretty drool worthy. I am not the brilliant inventor of the idea of battering cauliflower and tossing it with hot sauce to make a veg “hot wing”. These recipes have been flying around the internet, but I just couldn’t resist. Mainly because I wanted to eat them. I mean, hello, vegan bar food! Yes please! Ok, ok, I will stop patting my self on the back…but the house is empty right now, so someone had to! How did you manage to make this wonderful creation, you say? (I am sure someone said that). I made my batter recipe based on a tempura batter. (Hence the chopstick seen in photo 4). No frying needed, I just tossed them in a hot oven and I was delighted by just how crispy they got! UPDATE: The hot sauce, and maple syrup combo I made adds a nice thin coat of spicy sweetness. I heard from some of you that you would like more of a thick BBQ wing sauce, so if this is your thing, just use your favourite BBQ Sauce instead. For a homemade BBQ Sauce try the one in my Pulled Jackfruit Recipe. Lightly grease a baking tray, or for completely oil free use one of those non-stick baking mat thingies. (I need one of those). 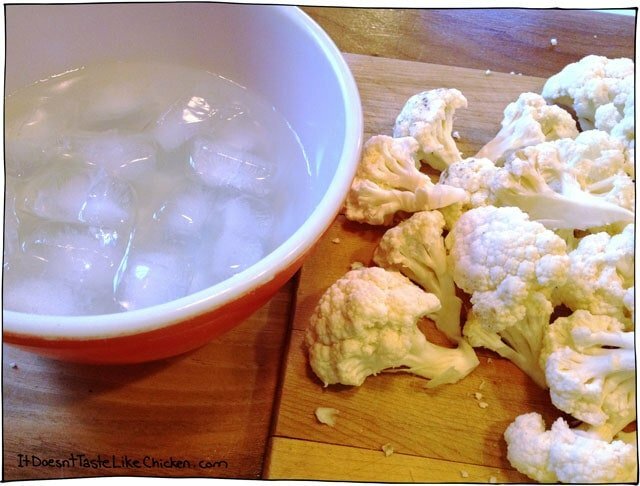 Chop up the cauliflower into “Thing” sized pieces. Fill a bowl with several handfuls of ice, and then fill it with plain or sparkling water. Let sit to cool the water. 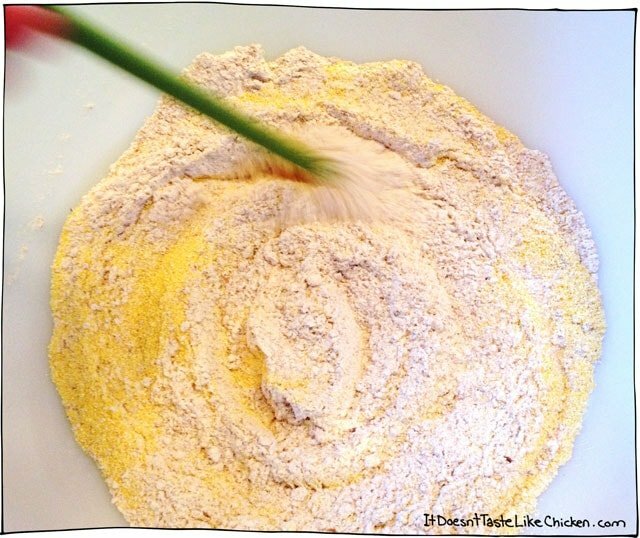 Using a chopstick or the handle of a spoon, whisk the whole wheat flour with the cornmeal. Then add in your water. It’s best to do this 1/2 a cup at a time, so you can keep an eye on the consistency. It may seem annoying to use a chopstick, but this is to help you not over mix the batter. Lumps are totally cool! You want the batter to be just thick enough so you can dip in the cauliflower and have the batter provide a nice coating. 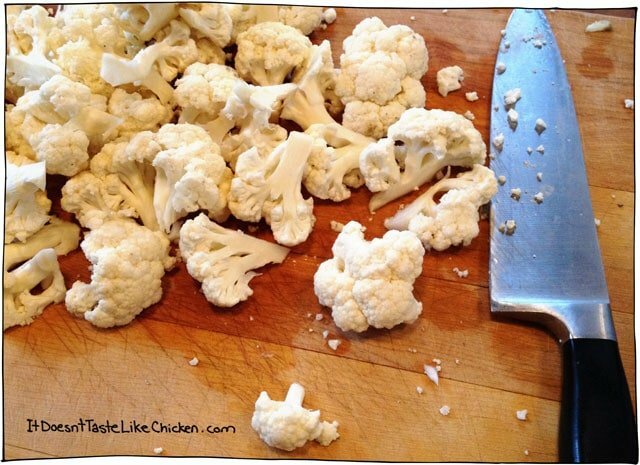 Once you reach this consistency, I find it easiest to toss a handful of cauliflower in the bowl, toss around to coat, and then use tongs to remove and shake off excess. 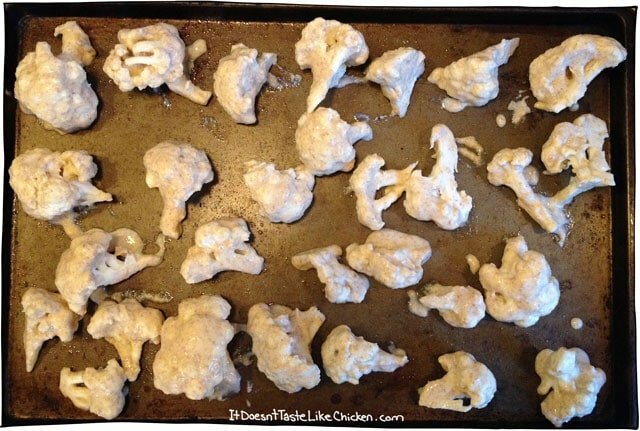 Fill a baking tray with the coated cauliflower. Make sure to give them enough space. Bake for 20 minutes at 450F until they are golden. When they are done, pull them out and let them rest for 5 minutes. (I find they are easier to remove, and crisp up even more if you let them rest). Make your “thing sauce” by combining the hot sauce and maple syrup or agave in a bowl. Toss the baked cauliflower in a large bowl, drizzle with hot sauce, and then toss to coat. Serve immediately. Made these tonight with a copycat Gold Fever (from 99 Pub) sauce recipe. PERFECT! Thank you for your hard work in figuring out this recipe. Totally met my craving for Gold Fever wings without the meat guilt! Made these today for lunch, did half hot sauce and half BBQ, they were fantastic! We ate too many! 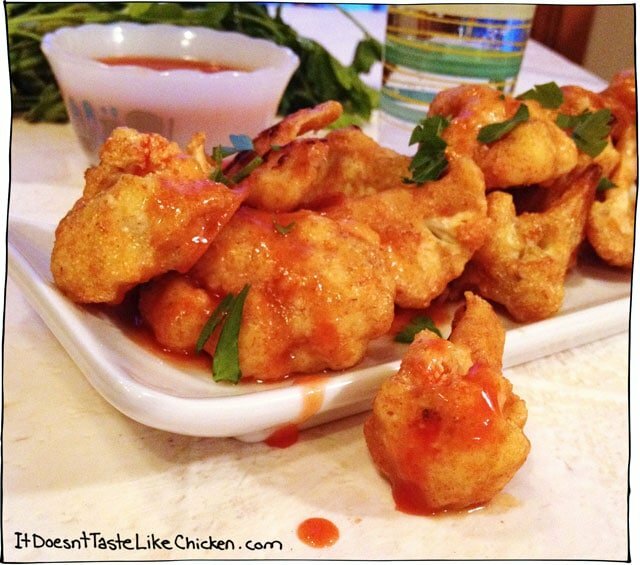 Would you use the same recipe for sweet and sour cauliflower except replace the hot sauce with sweet and sour sauce? My Italian grandma used to make cauliflower bits similar to these (only deep fried instead of baked) and it was HANDS DOWN everyone’s favorite food. ever. Mmmmm, yum. Unfortunately my favorite non-vegan indulgences include (or, let’s be real, completely function around) melty cheese, like fried mozzarella sticks and cheese fries and potato skins. Good lord, that sounds like a Super Bowl party if I’ve ever heard one, eh? Anyway, maybe a good nootch-infused queso for the potato skins and fries?! But it wouldn’t be too melty! Have you ever tried making vegan cheese? I plan to experiment more with vegan cheese and will post when I find something really good! Definitely looking forward to that! Now I’m craving the mozzarella sticks at our local vegan place, ughhhh. So yummy. I think I have a block of Daiya (or the Trader Joe’s version) in my fridge, but I’ve been trying to save it. Now seems like as good a time as any to break out the ooey gooeyness, ha! hahaha! Awesome. It does seem like an oozy gooey kind of night here as well….hmmmmm what shall I make…. vegan mozarella sticks eh? I gotta figure that recipe out! Haha! Already doing some research 😉 I ended up making a cheesy salad dressing! Really! How interesting… What did it taste like? Well the sauce was really good! However, the toppings I put on the salad were a little funny, so I would re-do it if I make it again. It had the same feeling as a caesar salad, but different flavour. Looks great! I know what you meant about the weather….It’s great during christmas time but come February I am sooo over winter! Haha! Yeah and another snow storm is about to happen tonight here. Agh! Worst part is digging out the car in the morning! Yum! I love how crispy you got these without any frying/oil! Very impressive.